This Post is Just Offal! Did you ever cringe at your Grandparents eating offal? My Great Grandmother regularly partook in a serving of crumbed lambs brain while I looked on, mouth agape, in horror. Offal was the gooey, slippery residual part of the animal. It was the waste that only people that lived through the great depression ate because they had nothing else. The habit of eating offal for my Great Grandmother must have continued out of some kind of weird post war visceral inertia. I never thought eating organs meats could have any real benefit. Over the past few years I have been bombarded with information about the nutritional benefits of offal. Rich in fat-soluble vitamins A and D, as well as essential fatty acids, traditional cultures around the world valued offal as an important food for pregnant women and growing children (Fallon, 2001). What’s also piqued my interest is the the relationship we traditionally had with organ meats, which is put so beautifully in this paragraph from an article by Lisa Cannizzaro from offalgood.com. “Helou explained her early cooking experiences; “My mother had taught us how to crack open the chicken’s skull to remove the tiny brains without damaging them; and she had also shown us how to peel the lizard-like skin off the feet to enjoy the gelatinous meat” (Strong, 2006, p. 37). This type of technique is no longer taught to younger children in today’s society, instead they are taught how to add oil, water and three eggs to Betty Crocker instant cake mixes and call it a baked delight. They are taught how to open up cans, how to punch holes in plastic film trays and pop their “food” into the microwave for two minutes on high. Children are deprived of valuable experiences with their parents and relatives in the new and ever-imposing world of fast-food as they become farther and farther departed from the origins of the food they eat”. I started thinking once again about my Great Grandmother Ailsa. Ailsa lived to the ripe old age of one hundred and had a mind as sharp as a tac well into her 90’s. After reading all these great articles I had no doubt that her whole food diet combined with her regular intake of organ meats contributed to her good health and longevity. I also felt sad that I had turned up my nose at her culinary choices and wasn’t able to start learning as a child what I’m just begining to learn independently now. Cooking whole traditional foods. So I made up my mind. I had to get past my preconceived aversion to offal and give it a try. 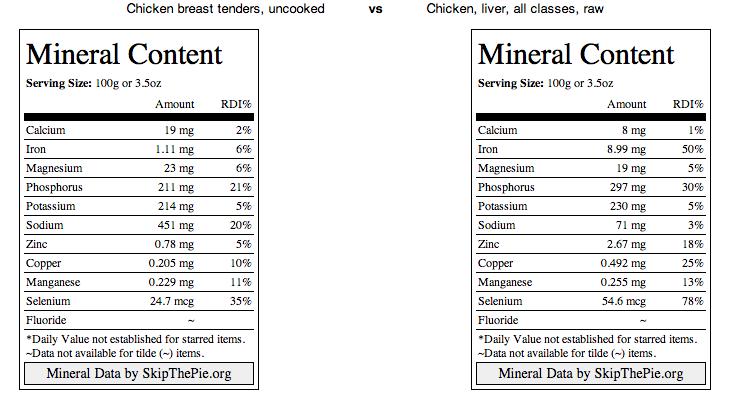 Organ meats are by far more superior nutritionally than the flesh of an animal. 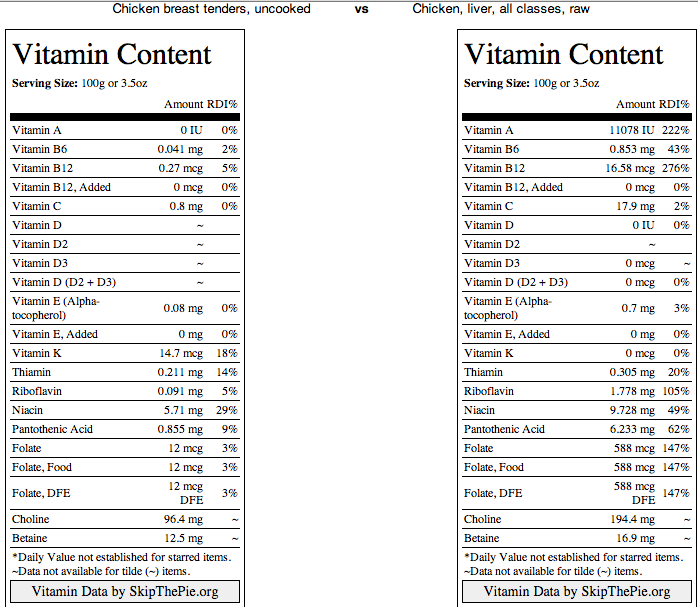 I also found this table on skipthepie.org that compares the nutritional value of chicken breast tenders to chicken livers. As with any meat, choosing pastured organic offal is the best choice. I chose some grass fed non-organic lambs liver or “fry” from our local butcher. I wasn’t too concerned about it being non-organic. From my understanding the liver detoxifies the blood but doesn’t store toxins. Toxins are stored in the fat of the animal. I was quite surprised at how large it was, and how cheap. 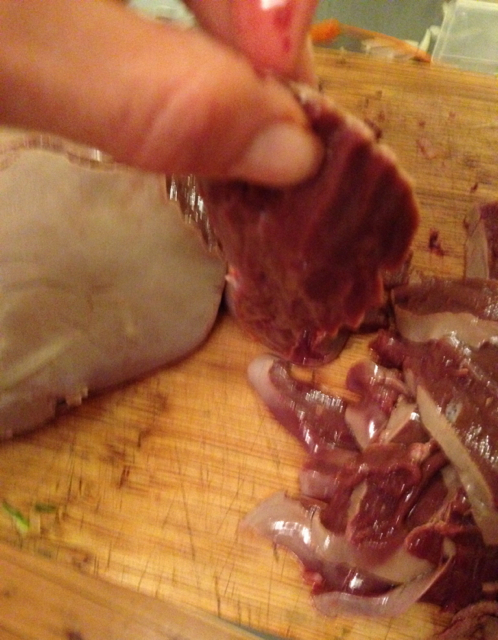 One lambs liver was 800g and cost me $4.50! This fed three adults and two children with a small bowl of leftovers. On a tight household budget this was a major saving on a week when our food budget was particularly tight and afforded me the option of buying more luxury food items like grass fed butter and organic eggs! Yum! 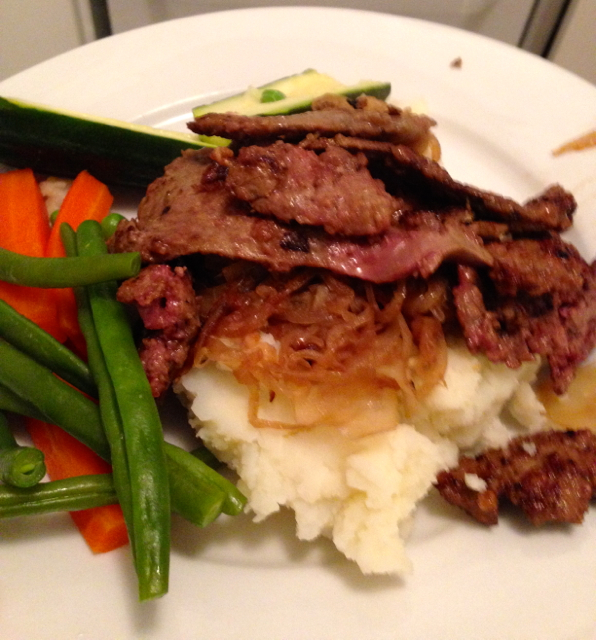 I scoured both my cookbooks and the internet for recipes for lambs fry and found most involved onions and bacon. Since i didn’t have any bacon, I decided to fry it served with mashed potato, caramelised onion and some steamed vegetables. Sally Fallons Nourishing traditions recommends first soaking liver in water with the juice of 2-3 lemons for several hours to draw out impurities and improve the texture of the liver. I also read another article suggesting to soak the liver in water for one hour changing the water at the half hour mark. I decided to do both. 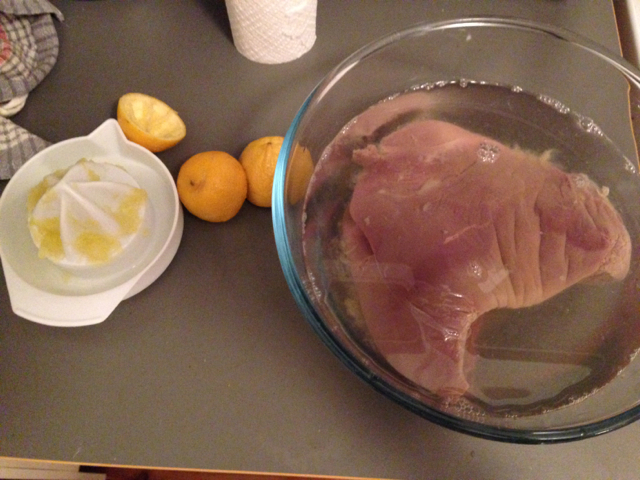 I soaked my Liver for 1 1/2 hours in lemon and water, changing the liquid every 30mins. When I had finished soaking the liver the outside had turned from a dark red colour to a pale grey. I then finely sliced it on an angle against the grain, lightly floured it and fried it up in some butter. Frying time is very short, a few seconds on either side on a medium/high heat. The liver should still be pink on the inside or else it will become tough. I was quite surprised at how tasty and tender it was. I had such a – I hate to say it – visceral reaction to handling the raw liver I thought that there was no way I was going to actually be able to eat it. The flavour was richer than regular meat, with a slightly metallic taste (perhaps from the high levels of copper?) and was no where as strong as I thought it was going to be. It was actually quite delicious. Frankie however, took a little coaxing. 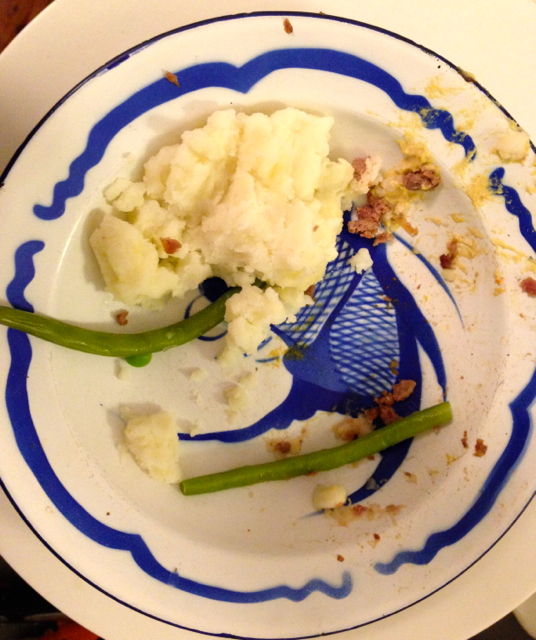 We worked out if she ate a forkful of liver combined with the mash and onions she liked it. Imi as with any meaty substance, gobbled hers all up and asked for more. My husband decided he was going to eat it everyday until we worked out he may be getting a bit too much vitamin A and might end up like Antarctic explorer Douglas Mawson, who got vitamin A toxicity form eating too much husky liver. Although eating lambs liver is quite safe, we decided a couple of times a week was probably enough. Definitely! we’ve added liver in our regular rotation of dinners and I’m really excited to try it this week with some yummy sow stall free speck. Do you regularly eat organ meats? What are your favourite recipes?